On 8 December 2018, I gave a speech in French to a room full of students at IMT Atlantic, the engineering school in Brest, France. The video will be out soon, but in the meantime, here is an English version of the text. The power of a choice. What to eat for lunch. Which road to take to avoid the traffic. Whether to stay in the library a few more hours and dine on snickers and chips; or go home now, eat something decent, and continue to study later. We would hope that every choice is made freely, no matter how big or small. How often are we faced with situations where we feel that we have no choice at all. There is no realistic option but to take one course of action. That’s just the way life is. It’s what is expected. Perhaps it is because we want to keep everyone else happy. Perhaps it is because our work demands it. Perhaps it is because these are the rules by which we live our life. Rules we learnt as kids, from our parents, our teachers, and reinforced through our own life experience as we get older. And so, we do what is expected, we keep everyone happy and comply with the rules. Because we believe we don’t have a choice. And so, we don’t choose. The thing with choices though is that even the fact of not choosing – is a choice in itself. And when we choose one thing, it goes without saying that we reject something else. Sometimes the thing we reject is ourselves. Our health. Our wellbeing. When we do that for years on end, that can become dangerous. I spent my entire career as a tax consultant choosing work over myself and my own wellbeing. And I can tell you that after a number of years it became critical. I am a lawyer by training and a former tax consultant. For years I woke up happy to go to work in an environment that was fun, challenging, and creative. On the face of it, I was a definition of success – the go to person for my teams, clients and bosses. The one who could come up with innovative solutions, and as a senior woman in my department, a model for other women in the department. But behind the façade of success, my life started to fall apart. Always having to be the strong one, never showing any weakness, never asking for help. Because I believed I had to do it all, and I couldn’t ask for help. And I started to wear myself out. But I felt trapped. I believed that this exhaustion was a normal part of the success. That to succeed as a tax consultant meant sacrificing my personal life, suffering and being in competition all the time. It was what I learned young, and what I saw being reinforced over time. And when things got tough, I worked some more. In fact, I didn’t know how to do anything else. I didn’t know how to slow down, or breathe, or take time for myself. And I kept on working till I exhausted myself completely and burned out. And one day, in 2014, it was time. It was time to take back control and look after myself. And it was time to remember that I did have a choice. But for that, I would need an electro shock. By then I felt that I was constantly walking through molasses, in a world where all the joy had been sucked dry. I woke every morning filled not with happiness or enthusiasm, but with dread – dread and fear that others would see through this façade to the truth. That I was an imposter, bad at my job, good for nothing. It was burnout number two and I was super glued to the sofa. Didn’t want to wash, to eat, to go out. And I certainly didn’t want to ask for help. But on the 6 March 2014, I had my wake-up call. That was the day of the funeral of a colleague, Peter. The day I chose to live. At the age of 67 Peter had died suddenly, and I just had to be at the funeral. He was a gentleman, and a gentle man. And I needed to go and pay my respects. During the funeral I realised something. He hadn’t just died of a heart attack. He had spent the Saturday and Sunday with friends, laughing and joking. And the Monday morning he got up, went to the red bridge in Luxembourg and jumped. What stood out in particular during the service were the words of his friends, and their eulogies. “We would have been there in a moment,” they said. “Why didn’t he just tell us”. Their sadness was clear – and their confusion. They had spent time with him less than 48 hours before. But it was nobody’s fault. Peter didn’t want them to see what he was living – that he had been fighting this hell of depression for years. And so, he had not said a word. As I got into the car that afternoon to come home, the tears came, and my heart broke. At 67 years old he had believed he didn’t have a choice. He was going through hell, but he couldn’t tell anyone. So, he did the only thing he could – he jumped. And at that moment, on 6 March 2014, sitting in my car, I made a decision. I decided that this was not going to be my life. This was not going to be my future. My friends were there. They would help. I could talk to them. But they weren’t telepathic. So, I picked up the phone and asked for help. Over the last five years I have picked myself up and taken back the choice. At first, I needed to sleep. Then I needed to find my friends again and remember that I wasn’t alone. I discovered yoga and meditation, and more importantly I thought long and hard about what it was I wanted or didn’t want in my life. After 16 years as a tax consultant I decided that there was more to life than tax returns. In 2014 I left my tax career behind and started a new life. Today I am an entrepreneur and I have my own business, and I do something that inspires me every day of my life. More importantly, I do it at a rhythm that I choose – not one imposed by others. Of course, it’s not easy. And there are days that the old reflexes and rules don’t want to leave me. There are days when I still feel guilty if I am not working 10 to 12 hours per day. But today I live a life where myself and my health are the most important choices that I make every day. This is not a question of becoming selfish or lazy. But it is about sleep, it’s about boundaries, and it’s about knowing that I am my own best asset. If I am exhausted and running on empty, I am no good to anyone. Over the last 5 years I have also spoken to other people about their experiences coming through a burnout to the other side. I have spoken to them about their fight against the burnout and their victory. Because what is clear from everyone is that they have all won a battle. They all have a day when they made a choice. A decision to choose themselves and their own wellbeing over the need to please everyone else, and a decision to no longer put their jobs first. For some it was a motor bike accident, a colleague who dropped down dead at work. For one it was the day she realised that she was so tired she couldn’t remember how to make spaghetti Bolognese for her kids. But whatever the reason, one day there was a choice. It’s not enough to want to change things. You must choose to change. And like me they now model daily the benefits of having enough sleep and rest – being able to bring their best selves to the world. Not a small version of ourselves, so knackered that we must fight to survive a single day. Is it easy to do that? To choose yourself to be the truest form of yourself? It’s not easy because sometimes we don’t even realise that we are telling ourselves there is no choice. We are simply running on auto pilot. Sometimes the reality of feeling there is no choice feels like a matter of life or death, and the reaction is physical. And sometimes, if we are truly honest, to recognise that we are in control of our own destiny and we can choose what is best for us, is about taking back responsibility for our own lives, and leaving to one side the possibility to remain a victim for an entire life time. So, no, it’s not easy. But it can be learned. It is a muscle that can be used. This is what I have learned. Perhaps it will help you too. 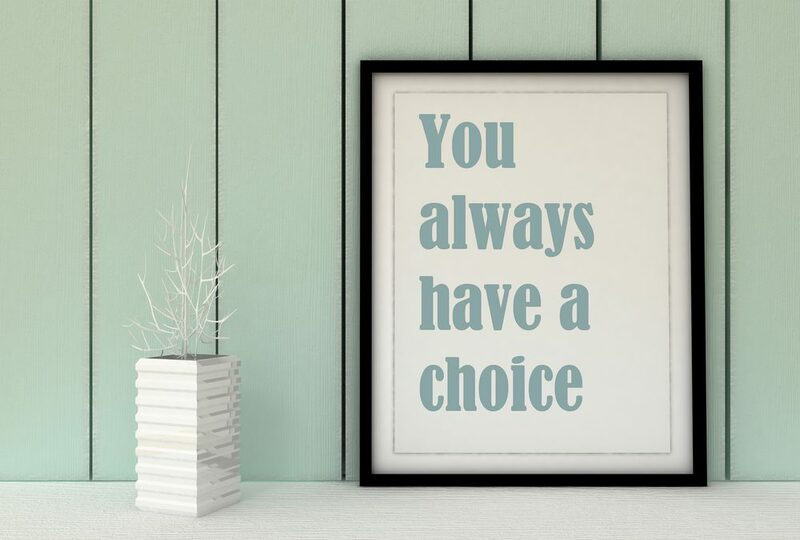 First, listen for those instances and catch yourself saying “I don’t have a choice”. Second, breathe and allow yourself to have that reflex – it’s been there for years after all. Breathe and regroup. And third – question that reflex. Is it true that you really have no choice? What could be a second or third option? Stop and think what you really want to do. Sure, you might well do what is expected, but at least this time you are doing that consciously and not on auto pilot. And maybe you will take another option. Is it easy? No, but it can be done. I didn’t know it at the time, but I do know it now. And another thing I know is what I wish – truly wish – for you today. It’s that you take your choices in full consciousness. It’s that you know that you don’t have to wait till your world is falling apart to choose. And for you, the students in this room? It’s that you take the time to breathe! Yes, you have survived the « cours préparatoires », the stress of the « concours », but now that you are at IMT Atlantic, it doesn’t let up. You need to be performing all the time, show yourself to be motivated, build your network, find a job, write your papers, deliver the pitches, do your exams. It just keeps coming. Breathe or you will find yourself learning and reinforcing habits that might lead you to a burnout later down the road. No one believes when they start a career that they will have a burnout, but it happens more than you think. Otherwise it’s like you are sitting in a saucepan of water, and the water is heating up slowly and gently. So slowly and gently that you don’t even notice. And you won’t notice till it’s too late. You won’t fail your exams or get kicked out just because you took five minutes to breathe. And take back control of your choices. Avoiding a burnout and jumping out of the saucepan is just one example of what can happen if you take back control of your choices. And if you were to take back control and choose yourself every day – starting today. Just imagine the life you could lead! Dear Joanna, many thanks for putting your tough journey into inspirational words!!!! Basically it is exactly my own journey just on another domain and profession … l do agree with you on the importance of breathing and meditation to set the scene on our minds for being able to take the very best choices for ourselves in life ! We don’t have to be perfect all the time- failure and stepping back is also normal especially to mind ourselves, that we easily cross-over to create more time everything else we do for others; family, friends, work, etc etc but ourselves … once we hit burnout , it takes much longer to heal ourselves that you will be regretful to spend that time for quality activities for your own much earlier rather than spending at the clinics … basically burn-in starts much earlier than burn-out stage to give early signals ….. Please listen the heat inside before it burns everything inside out to take corrective actions !!! Wishing everyone a mindful journey over their lives, to be their own boss on taking their own decisions even if they work for others and keep doing the things that please them most! I like how you articulate the notion of “burn-in” – such a powerful and helpful image!